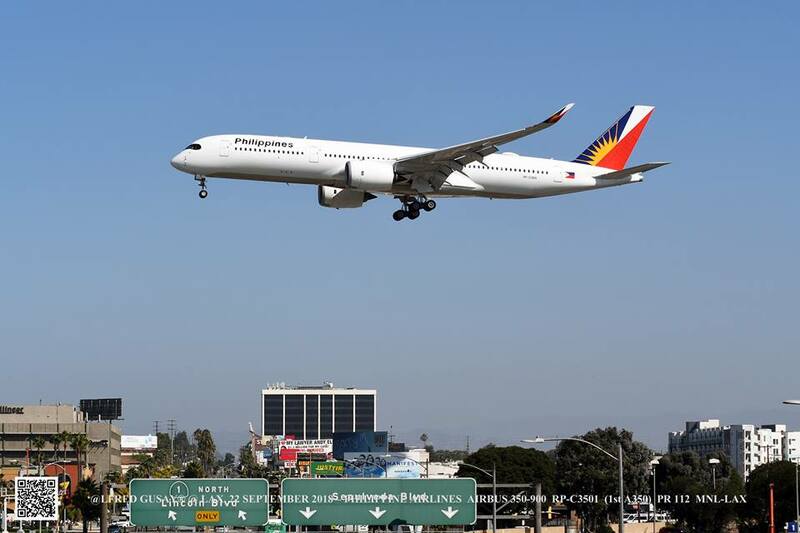 Aviation Updates Philippines - National flag carrier, Philippine Airlines, deployed its brand-new Airbus A350-900 to Los Angeles, California on Friday, September 21 for the first time. THE ICONIC LAX SHOT. Alfred Gusay from the Aviation Photography Enthusiasts (APE) group captures this Airbus A350-900 of Philippine Airlines arriving in Los Angeles. Los Angeles marks the first airport in the United States to receive PAL's A350 fleet for the first time. It is also its first time to cross the Pacific. RP-C3503, operating flight PR 112, departed Manila at around 11:52am local time. It arrived in Los Angeles at 9:30am PDT. The total flying time is 12 hours and 38 minutes. On the same day, RP-C3504 also had its first revenue service via PR 720 from Manila to London-Heathrow. Meanwhile, PAL is scheduled to commence direct flights to New York on October 28, 2018. It will replace the airline's Manila-New York service currently operated with a stop-over in Vancouver. The planned five-times-a-week direct service on the A350 will cut flight time between Manila and New York by four hours since it will no longer have a stop-over in Vancouver. The flag carrier's A350 fleet is currently being deployed to London-Heathrow, Hong Kong, and Bangkok. It now operates a total of three of the type, and three more are expected to arrive before the year ends. PAL received its first A350-900 with registry RP-C3501 on July 15. Based from previous reports on this site, the fleet features an upgraded state-of-the-art cabin for better passenger comfort and safety on longhaul flights around the world. Philippine Airlines, by 2020, is aiming to achieve its 5-star airline rating. In line with its goal, it has continuously improved its passenger services. Skytrax awarded PAL for being among the top most-improved airlines this year. If you ever decide to import anything again, be sure to have enough money to buy several thousand, and it goes via container, because most mail shipments aren't checked by China Customs.